When the Stone of Scones, a priceless artifact, is stolen from Westminster Abbey, Charlie Chan and the Chan Clan take on the job of getting it back. 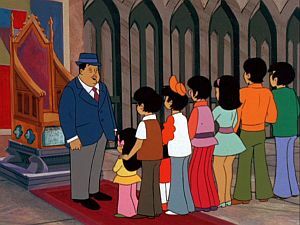 This sixteenth and final episode of The Amazing Chan and the Chan Clan takes on a title that is reminiscent of similarly titled many entries in the Charlie Chan film series from Twentieth Century-Fox: The Chan Clan at Scotland Yard. Scotland Yard - Headquarters of the Metropolitan Police Service (MPS), the police force responsible for whose territory encompasses most of the city of London, England. Scotland Yard got its name from the location of the original Metropolitan Police headquarters, 4 Whitehall Place, which had a rear entrance on a street called Great Scotland Yard. As the public was allowed to use this rear entrance, over time the Metropolitan Police became headquarters became popularly known as Scotland Yard. Flip Chan: "We're headin' for Scotland Yard, right Pop?" 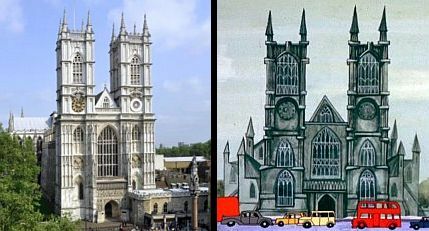 Westminster Abbey, and as portrayed in Charlie Chan at Scotland Yard. Westminster Abbey - This famous church large Gothic abbey church in the City of Westminster, London, England. It is one of the most important religious buildings in the country and is noted as the traditional site of the coronation and burial of monarchs. Charlie Chan: "You're headed for Westminster Abby..."
Jarrod's Department Store - Harrod's is a luxury department store located on Brompton Road in Knightsbridge, London, England. The store covers an area of five acres, houses over 300 departments filling a million square feet of retail space. Henry Chan: "Jarrod's Department Store, limited." Harrod's Department Store, and Jarrod's Department Store. When the impossible is illiminated, then, what is left must be possible.